The Government Information Reference Unit maintains comprehensive collections of Connecticut and United States government publications dating from the late 1700's to the present. 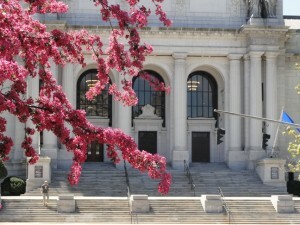 These collections support the Library's roles as the Regional Federal Depository for Connecticut and Rhode Island, and as the Connecticut State Documents repository. Find the name and contact information for your Representative, Senator, and Congressperson. Indexes compiled to assist researchers and the public in locating hard to find state & federal government publications on a variety of topics. American State Papers, 1789-1838 Description of this database. Congressional Research Digital Collection Description of this database. Connecticut General Assembly Members Description of this database. U.S. Congressional Serial Set, 1817-1980 Description of this database. Click to see a list of all government information databases. Provides access to legislative information for Members of Congress, legislative agencies, and the public. GPO created guides on a wide range of topics including Art, Architecture, Military and Veterans Resources and World War I. Official web portal of the U.S. federal government. Primarily federal, but also selected state, local, and tribal. Provides information on the legislative, judicial, and executive branches.